In Yeshua’s Thanksgiving Hymn the Holy Spirit inspires Jesus to utter an Essene-style hymn that expresses gratitude for the divine revelation that was being disclosed to his followers. The author of Matthew placed Yeshua’s Thanksgiving Hymn immediately after the Woes on Three Villages pericope (Matt. 11:20-24 // Luke 10:13-15). In Luke, Yeshua’s Thanksgiving Hymn also appears in fairly close proximity to the Woes on Three Villages pericope, which the author of Luke includes in the context of the mission of the seventy-two disciples. Although the author of Matthew removed Woes on Three Villages and Yeshua’s Thanksgiving Hymn from the mission of the twelve apostles context, we believe the close proximity of these two pericopae in both Matthew and Luke reflect their inclusion in the mission of the twelve apostles context in their shared source, the Anthology (Anth.). In the center of this photo, courtesy of Joshua N. Tilton, is the partially reconstructed synagogue of Chorazin, one of the towns mentioned in the Woes on Three Villages pericope. Robert Lindsey believed it was the Anthologizer (the creator of Anth.) who was responsible for breaking up integrated units of narrative, teaching and parables and rearranging these literary fragments according to theme or genre. For this reason Lindsey sometimes referred to the Anthology as the “Reorganized Scroll.” The Anthologizer’s reorganizing activity not only removed some materials from their original contexts, it also forged new links between sayings that were not originally connected in the conjectured Hebrew Life of Yeshua. We regard the Anthology’s apparent inclusion of Woes on Three Villages in the sending of the Twelve context as one example of how the Anthologizer sometimes inserted materials into contexts where they did not originally belong, and how these misplacements where then passed along to Luke and Matthew. Another example of a secondary link that the Anthologizer created and then passed along to Matthew and Luke is the joining of Yeshua’s Thanksgiving Hymn (Matt. 11:25-26 // Luke 10:21) with a saying about how father and son share mutual knowledge (Matt. 11:27 // Luke 10:22). Since the father and son saying immediately follows Yeshua’s Thanksgiving Hymn in Luke and Matthew, there can be little doubt that these sayings were also adjacent in Anth. And although Yeshua’s Thanksgiving Hymn and the father and son saying share themes and vocabulary pertaining to revelation and fatherhood, there are significant differences between the two sayings. Among the most important differences between the two sayings is the different audiences to whom they are addressed. Whereas Yeshua’s Thanksgiving Hymn is a prayer addressed to God, the father and son saying is didactic material addressed to Jesus’ followers. In Yeshua’s Thanksgiving Hymn, moreover, Jesus praises God who reveals his mysteries to the simple, whereas in the father and son saying it is the son who discloses revelations about the father. Yeshua’s Thanksgiving Hymn is written in the style of Essene poetry, whereas the father and son saying is prose and more easily reconstructed in Mishnaic-style Hebrew. Thus, although we are convinced that the father and son saying was linked to Yeshua’s Thanksgiving Hymn at a pre-synoptic stage of transmission, we do not believe that Jesus uttered the two sayings on the same occasion, and it seems unlikely that they appeared in the same context in the conjectured Hebrew Life of Yeshua. For this reason we have not included the saying about a father and son’s mutual understanding in the “Mission of the Twelve” complex. Yeshua’s Thanksgiving Hymn, on the other hand, does seem to belong with the sayings that make up Jesus’ response to his apostles’ return from their mission. To see an overview of the entire “Mission of the Twelve” complex, click here. Since in his tenth chapter the author of Luke followed the Anthology’s account of the apostles’ mission and Jesus’ response to the apostles’ return, we would expect that Yeshua’s Thanksgiving Hymn was also copied from Anth. This expectation is confirmed by the high degree of verbal agreement between the Lukan and Matthean versions of Yeshua’s Thanksgiving Hymn, which, according to Lindsey, occurs in double tradition pericopae when the authors of Luke and Matthew each copied from their shared source, the Anthology. Only in the narrative introductions to Yeshua’s Thanksgiving Hymn do Luke and Matthew significantly differ. Luke’s narrative introduction is easy to reconstruct in Hebrew, and the role accorded to the Holy Spirit in Luke’s introduction is wholly consistent with the oracular function of the Holy Spirit in ancient Jewish sources (see below, Comment to L1-3). There is good reason, on the other hand, why the author of Matthew might have wanted to play down the exultant tone of the introduction to Yeshua’s Thanksgiving Hymn, since in Matthew the thanksgiving hymn appears immediately after the pronouncement of the Woes on Three Villages. It seems likely, therefore, that Luke preserves the original introduction to Yeshua’s Thanksgiving Hymn, whereas Matthew’s introduction has been revised in order to more fully integrate the hymn into its Matthean context. Would addressing God as “my father” have been considered offensive or blasphemous in first-century Jewish culture? Who are the “wise and intelligent” and who are the “simple” in Yeshua’s Thanksgiving Hymn? Did Jesus ever address God as “Abba”? L1-3 The introductions to Yeshua’s Thanksgiving Hymn in Matthew and Luke have markedly different wording. Nevertheless, they both begin with a time marker and end with εἶπεν (eipen, “he said”). Luke’s introduction mentions Jesus’ exultation in the Holy Spirit. Matthew’s version is much more bland by comparison. Did the author of Luke add dramatic details to the introduction, or did Matthew rework the wording of Anth. 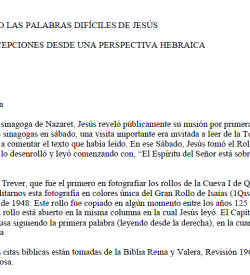 in order to create a more generic opening that suited the context in which Matthew includes Yeshua’s Thanksgiving Hymn? We incline toward the latter view. This illumination from the fourteenth-century C.E. Sarajevo Haggada pictures Rabban Gamliel (Gamaliel) II, grandson of the apostle Paul’s teacher. Image courtesy of Wikimedia Commons. Supernatural knowledge and ecstatic speech are characteristic traits of prophecy, and it is therefore natural to find that the Holy Spirit was regarded in ancient Jewish sources as the fount and inspiration of prophecy. Given that Jesus’ contemporaries regarded him as a prophet (cf. Luke 7:16; 24:19), and that in his thanksgiving hymn Jesus uttered ecstatic speech about the revelation of supernatural knowledge to his followers, the mention of the Holy Spirit in Luke’s introduction to Yeshua’s Thanksgiving Hymn is in complete harmony with ancient Jewish understandings of the role and function of the Holy Spirit. We have therefore accepted Luke’s introduction for GR and HR in L1-3. L1 ἐν ἐκείνῳ τῷ καιρῷ (Matt. 11:25). The phrase ἐν ἐκείνῳ τῷ καιρῷ (en ekeinō tō kairō, “in that time”) is relatively rare in LXX, occurring only 5xx, where it is the translation of בָּעֵת הַהִוא (bā‘ēt hahi’, “in that time”; Deut. 10:1, 8), בָּעִתִּים הָהֵם (bā‘itim hāhēm, “in those times”; 2 Chr. 15:5), or the Aramaic phrase בֵּהּ זִמְנָא (bēh zimnā’, “in the time”; Dan. 3:8; 4:36). Although it would be possible to reconstruct Matthew’s opening phrase in Hebrew as בָּעֵת הַהִיא, we believe Luke’s opening phrase is even more Hebraic. We note that the phrase ἐν ἐκείνῳ τῷ καιρῷ is unique to Matthew in NT, where it occurs 3xx (Matt. 11:25; 12:1; 14:1). This phrase is also similar to ἐν τούτῳ τῷ καιρῷ (en toutō tō kairō, “in this time”), κατ᾿ ἐκεῖνον τὸν καιρόν (kat ekeinon ton kairon, “about that time”) and κατὰ τοῦτον τὸν καιρόν (kata touton ton kairon, “about this time”), phrases familiar from Josephus. בְּאוֹתָהּ הַשָּׁעָה (HR). Luke’s introductory phrase, ἐν αὐτῇ τῇ ὥρᾳ (en avtē tē hōra, “in it the hour”; Luke 10:21), is unusual in Greek, and has, accordingly, invited comment from scholars. T. W. Manson noted, “‘In that same hour’ corresponds exactly to the Rabbinic phrase be’ōthāh shā‘āh.” The phrase בְּאוֹתָהּ שָׁעָה (be’ōtāh shā‘āh) is common in rabbinic sources, and we concur with Manson that it is a close match for Luke’s ἐν αὐτῇ τῇ ὥρᾳ. More rarely in rabbinic sources, however, the phrase occurs with the definite article, בְּאוֹתָהּ הַשָּׁעָה (be’ōtāh hashā‘āh), and since this is an even more exact match for Luke’s introductory phrase, we have adopted it for HR. Adopting בְּאוֹתָהּ הַשָּׁעָה for HR is an example of the blended type of Biblical and Mishnaic Hebrew in which we believe the conjectured Hebrew Life of Yeshua was composed, and which is also attested in the baraita about King Yannai preserved in b. Kid. 66a, which may have been taken from a Hebrew document written toward the end of the Second Temple period. In addition to rejoicing in the Holy Spirit, this passage from the Thanksgiving Hymns relates to God as a father and expresses gratitude to God for having made himself known, themes similar to those found in Yeshua’s Thanksgiving Hymn. שָׂשׂ בְּרוּחַ הַקֹּדֶשׁ (HR). We considered three main possibilities for reconstructing ἀγαλλιᾶσθαι (agalliasthai, “to rejoice”): 1) שִׁעֲשַׁע (shi‘asha‘, “take delight”); 2) גָּל (gāl, “rejoice”); and 3) שָׂשׂ (sās, “delight”). 1. Reconstructing ἀγαλλιᾶσθαι with שִׁעֲשַׁע is suggested by the parallel in the Thanksgiving Hymns cited just above which reads, וברוח קודשכה תשעשעני (“and by your Holy Spirit you have delighted me”; 1QHa XVII, 32). However, in LXX neither שִׁעֲשַׁע nor הִשְׁתַּעֲשַׁע (hishta‘asha‘), from the same root, are ever rendered with ἀγαλλιᾶσθαι. While this fact does not automatically disqualify שִׁעֲשַׁע as a candidate for HR, it does encourage us to keep searching for other possibilities. 2. In support of reconstructing ἀγαλλιᾶσθαι with גָּל is the fact that in LXX no other verb translates גָּל more often than ἀγαλλιᾶσθαι. In addition, the construction גָּל +‎ -בְּ is well attested in MT and DSS. Moreover, reconstructing with גָּל would allow for a wordplay with גִּלָּה (gilāh, “reveal”; L8) in Yeshua’s Thanksgiving Hymn. While these facts make גָּל a viable candidate for HR, a weakness of this option is that we have been unable to find a parallel to “rejoice in the Holy Spirit” that uses the verb גָּל. The revelation of mysteries concealed from the wise is the central theme of Yeshua’s Thanksgiving Hymn, making an allusion to Psalm 51 in Luke 10:21 all the more appropriate. We cannot exclude the possibility that the author of Luke created the allusion to Psalm 51 on the basis of the Septuagint. The LXX translators rendered שָׂשׂוֹן (“joy”) in Ps. 51:14 with ἀγαλλίασις (agalliasis, “gladness”), a cognate of the verb ἀγαλλιᾶσθαι, which occurs in Luke 10:21. It is possible, therefore, that the author of Luke was responsible for inserting the description of Jesus’ rejoicing in the Holy Spirit into the introduction of Yeshua’s Thanksgiving Hymn, as so many scholars suggest. However, we believe it is more likely that the mention of the Holy Spirit and the allusion to Psalm 51 were already embedded in Luke’s source, since the subtle kind of allusion this entails seems more likely to have been the work of a Jewish author writing in Hebrew than a Gentile author writing in Greek. Our reconstruction, then, supposes that שָׂשׂ בְּרוּחַ הַקֹּדֶשׁ (“he delighted in the Holy Spirit”) is an allusion to the שָׂשׂוֹן (“joy”) that comes from the presence of the Holy Spirit, according to Psalm 51. בְּרוּחַ הַקֹּדֶשׁ (HR). On reconstructing πνεῦμα (pnevma, “spirit,” “wind”) with רוּחַ (rūaḥ, “spirit,” “wind”), see Return of the Twelve, Comment to L25. The LXX translators usually rendered the the noun קֹדֶּשׁ (qodesh, “holiness”) with the adjective ἅγιος (hagios, “holy”), and consequently a great many instances of ἅγιος in LXX reflect קֹדֶּשׁ in the underlying Hebrew text. Even more importantly for the present discussion, the few instances of רוּחַ קֹדֶּשׁ (rūaḥ qodesh, “spirit of holiness” [i.e., “Holy Spirit”]) in MT are all rendered as τό πνεῦμα τὸ ἅγιον (“[the] holy spirit”) in LXX (Isa. 63:10, 11; Ps. 50:13). Examples of בְּרוּחַ הַקֹּדֶשׁ (berūaḥ haqodesh, “by/in the Holy Spirit”) and close equivalents are known from DSS and rabbinic sources. In LXX בְּרוּחַ (berūaḥ, “in/by a wind/spirit”) is frequently translated as ἐν πνεύματι (en pnevmati, “in/by a wind/spirit”). ἠγαλλιάσατο ἐν τῷ πνεύματι τῷ ἁγίῳ (GR). In one instance we find καὶ τῷ πνεύματι τοῦ στόματος αὐτοῦ (“and by the wind of his mouth”; Ps. 32:6) where the Hebrew text has וּבְרוּחַ פִּיו (“and by the wind of his mouth”; Ps. 33:6). In this instance the Greek has no preposition, such as ἐν (en, “in,” “by”), equivalent to -בְּ (be, “in,” “by”). The text of Vaticanus, which we use as the base text for our reconstruction, also lacks the preposition ἐν in L2. Many NT manuscripts do have ἐν in Luke 10:21, however, and although the example from Ps. 32:6 (LXX) shows that a Greek translator might choose to omit a preposition equivalent to -בְּ, it seems more likely that the omission of ἐν in the text of Vaticanus was a scribal error. We have therefore restored ἐν to GR in L2 on the textual evidence that ἐν is the original reading in Luke 10:21. L3 ἀποκριθεὶς ὁ Ἰησοῦς εἶπεν (Matt. 11:25). Matthew’s introduction to Yeshua’s Thanksgiving Hymn mentions Jesus by name and has him “answering,” even though the thanksgiving hymn occurs in the middle of a lengthy section of discourse. We regard Luke’s introduction to Yeshua’s Thanksgiving Hymn as more original, and have therefore reconstructed Luke’s καὶ εἶπεν (kai eipen, “and he said”) as וַיֹּאמֶר (vayo’mer, “and he said”). Note the oscillation between Mishnaic-style Hebrew in L1 and L2 of HR and Biblical-style Hebrew with the use of vav-conversive here in L3. Such an admixture of MH and BH elements is also characteristic of the baraita about King Yannai in b. Kid. 66a. L4-11 In contrast to the narrative introductions, which have very low verbal identity, the thanksgiving hymn itself is nearly identical in Matt. 11:25-26 and Luke 10:21. Illustration by Margaret Dickinson of the clay jars with lids that contained the Dead Sea Scrolls discovered at Qumran. In the Qumran Thanksgiving Hymns we encounter the formulae אודכה אלי כי (“I will give you thanks, my God, because…”; 1QHa XIX, 3; cf. XIX,15) and אודכה אדוני כי (“I will give you thanks, my Lord, because…”; 1QHa X, 20, 31; XI, 19, 37; XII, 5; XIII, 5; XV, 6, 26, 34; XVI, 4). These formulae from the Thanksgiving Hymns are closer to “I thank you, Father, Lord of heaven and earth, that…” (Matt. 11:25; Luke 10:21) than to the opening formula “I am giving thanks before you” in the rabbinic prayers. While there are points of similarity between these rabbinic prayers and Yeshua’s Thanksgiving Hymn, such as the offering of thanks and relative brevity, Yeshua’s Thanksgiving Hymn is more akin to the Qumran Thanksgiving Hymns in terms of content (esoteric knowledge) and style. We have therefore reconstructed ἐξομολογοῦμαί σοι (“I confess to you”) with אוֹדְךָ (“I will thank you”) in conformity with the style of the Qumran Thanksgiving Hymns, supposing that the Greek translator of the conjectured Hebrew Life of Yeshua gave a non-Septuagintal rendition of the underlying Hebrew text. אָבִי (HR). 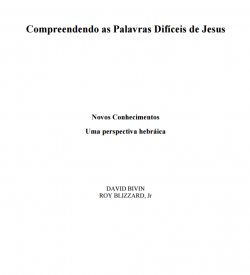 On reconstructing πατήρ (patēr, “father”) with אָב (’āv, “father”), see Demands of Discipleship, Comment to L5. Many scholars presume that behind the vocative πάτερ (pater, “Father!”) in Matt. 11:25 and Luke 10:21 stands an original אַבָּא (’abā’, “father”), and on the grounds that אַבָּא is Aramaic many scholars conclude that Jesus delivered his teachings in Aramaic and that it was in Aramaic that the earliest followers of Jesus preserved his teachings. It should be noted, however, that אַבָּא is Hebrew as well as Aramaic, so Jesus’ conjectured use of אַבָּא when addressing God is hardly probative one way or the other. We regard אַבָּא as an improbable reconstruction for πάτερ in L4, not because Jesus could not have addressed God as “Abba” (see below, Comment to L9), but because in LXX the vocative form πάτερ with no possessive pronoun is the standard translation of אָבִי (’āvi, “my father”). Thus, on the basis of LXX we should expect to reconstruct πάτερ in Hebrew as אָבִי.‎ Although some scholars have claimed that in the first century C.E. the form אָבִי was obsolete, their claim is erroneous. The form אָבִי is attested in DSS, including in the Thanksgiving Hymns, which has so many affinities with Yeshua’s Thanksgiving Hymn, as well as in rabbinic sources. In addition, אָבִי (“my father”) is attested in Second Temple Jewish sources as an address to God in prayer. It seems likely, therefore, that Jesus adopted a known and accepted, albeit rare, form of address to God in the opening of his thanksgiving hymn. 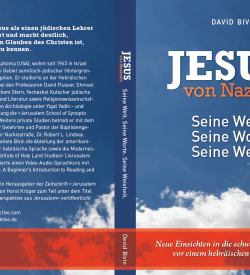 According to Flusser, Jesus linked his divine sonship with his prophetic task to pronounce judgment upon Jerusalem. That Jesus understood this task to be prophetic is clear from his statement that “no prophet can die outside Jerusalem” (Luke 13:33; cf. Matt. 23:37; Luke 13:34), while the links between his prophetic task and divine sonship are evident in the “only son”/“rejected stone” (אבן/בן) wordplay in the Wicked Tenants parable (Luke 20:13, 17). In Yeshua’s Thanksgiving Hymn Jesus’ status as God’s son is hinted at by means of his address to God as “Father” (L4, L9), while his prophetic status is alluded to via the mention of the Holy Spirit (Luke 10:21; L2). L5 κύριε τοῦ οὐρανοῦ καὶ τῆς γῆς (Matt. 11:25; Luke 10:21). We have not been able to find a precise parallel to the title “Lord of heaven and earth” in Hebrew sources. We do, however, find ὁ κύριος τοῦ οὐρανοῦ καὶ τῆς γῆς (“the Lord of the heaven and the earth”) in Tob. 7:17, a source which may have been composed in Hebrew. We also find the similar title δέσποτα τῶν οὐρανῶν καὶ τῆς γῆς (“ruler of the heavens and the earth”) in Judith 9:12, another source with a likely Hebrew vorlage. Likewise, Josephus knew the title δέσποτα τῶν ἐπ᾿ οὐρανοῦ τε καὶ γῆς καὶ θαλάσσης (“ruler of what is in heaven and earth and sea”; Ant. 4:40), and in the Aramaic Genesis Apocryphon Melchizedek refers to the LORD as אל עליון מרה שמיא וארעא (“God Most High, Lord of the heavens and the earth”; 1Qap Genar XXII, 16; cf. XXII, 21), which is based on Gen. 14:19 where the LORD is called אֵל עֶלְיוֹן קֹנֵה שָׁמַיִם וָאָרֶץ (“God Most High, possessor of heavens and earth”). Thus the title “Lord of heaven and earth” was certainly known in the first century C.E. and was probably current in Hebrew as well as Aramaic. An enamel plaque depicting the meeting of Abram and Melchizedek described in Genesis 14. In that chapter Melchizedek refers to God as “possessor of heaven and earth.” Image courtesy of Wikimedia Commons. אֲדוֹן שָׁמַיִם וָאָרֶץ (HR). Although the precise formula “Lord of heaven and earth” is not attested in extant Hebrew sources, we do find similar titles in the Hebrew Bible and in post-biblical Jewish literature. Thus, in MT we encounter titles such as קֹנֵה שָׁמַיִם וָאָרֶץ (qonēh shāmayim vā’āretz, “possessor of heaven and earth”), עֹשֵׂה שָׁמַיִם וָאָרֶץ (‘osēh shāmayim vā’āretz, “maker of heaven and earth”) and אֲדוֹן כָּל הָאָרֶץ (’adōn kol hā’āretz, “Lord of all the earth”). In DSS we find the title אדון הכול (’adōn hakōl, “Lord of everything”; 4Q409 1 I, 6), a title that also occurs in the Aleinu prayer that is still recited today. In rabbinic texts we encounter titles such as אדון כל הבריות (’adōn kol haberiyōt, “Lord of all the creatures”) and רִבּוֹנוֹ שֶׁל עוֹלָם (ribōnō shel ‘ōlām, “master of [the] universe”). Each of these titles emphasizes the universality of God’s dominion and his mastery over creation. While reconstructing κύριε (kūrie, “Lord”) with אֲדוֹן (’adōn, “Lord”) requires no explanation, the omission of definite articles in our reconstruction does warrant comment. In the two biblical titles קֹנֵה שָׁמַיִם וָאָרֶץ (“possessor of heaven and earth”) and עֹשֵׂה שָׁמַיִם וָאָרֶץ (“maker of heaven and earth”), “heaven” and “earth” are anarthrous, but when the LXX translators put these titles into Greek they consistently rendered “heaven” and “earth” with definite articles: ὃς ἔκτισεν τὸν οὐρανὸν καὶ τὴν γῆν (“who created the heaven and the earth”; Gen 14:19, 22) and ὁ ποιήσας τὸν οὐρανὸν καὶ τὴν γῆν (“the maker of the heaven and the earth”; Ps. 113:23; 120:2; 123:8; 133:3; 145:6). It is on the basis of these examples that we have reconstructed κύριε τοῦ οὐρανοῦ καὶ τῆς γῆς as אֲדוֹן שָׁמַיִם וָאָרֶץ (“Lord of heavens and earth”) instead of אֲדוֹן הַשָּׁמַיִם וְהָאָרֶץ (“Lord of the heavens and the earth”). Note the juxtaposition of the titles אבי ואדוני (“my Father and my Lord”) in the Second Temple Jewish prayer preserved in 4Q460 5 I, 6, similar to the juxtaposition of πάτερ κύριε τοῦ οὐρανοῦ καὶ τῆς γῆς (“Father, Lord of heaven and earth”) in Yeshua’s Thanksgiving Hymn. L6 ὅτι ἔκρυψας ταῦτα (GR). We have preferred Matthew’s reading over Luke’s for GR, supposing that the author of Luke replaced the simple ἔκρυψας (ekrūpsas, “you hid”) with the compound form ἀπέκρυψας (apekrūpsas, “you hid away”) in Luke 10:21 as a minor stylistic improvement. How many iniquities and sins do I have? Make known to me my wrongful deeds and my sins. In the above example the definite direct object marker is omitted with the verb הִסְתִּיר (“hide”), just as we have omitted it in HR. We have reconstructed ταῦτα (tavta, “these”) with אֵלֶּה, even though in MH אֵלֶּה had been replaced by אֵלּוּ (’ēlū, “these”). Although Yeshua’s Thanksgiving Hymn is direct speech, we believe it was composed in the style of the Qumran Thanksgiving Hymns, which, like other Essene texts, adopted an archaic style of Hebrew. To what does “these things” in the statement “you have hidden these things from the wise and understanding” (Matt. 11:25; Luke 10:21) refer? It is likely to be the “mysteries of the Kingdom of Heaven,” which Jesus mentions in the Mysteries of the Kingdom of Heaven saying (Matt. 13:11; Mark 4:11; Luke 8:10). For reasons we will discuss in the commentary accompanying the reconstruction of the Mysteries of the Kingdom of Heaven pericope, we believe this saying may originally have followed Yeshua’s Thanksgiving Hymn in the conjectured Hebrew Life of Yeshua. Whereas Isa. 29:14 speaks of hiding understanding, which is similar to “you have hidden…from the wise and intelligent” in Yeshua’s Thanksgiving Hymn, Hos. 14:10 laconically refers to “these things,” just as Jesus does in L6. Perhaps Jesus intended to allude to both of these verses. Drawing of an eye by Thomas Holloway (ca. 1794). Image courtesy of Wikimedia Commons. The Blessedness of the Twelve pronouncement is not an expression of sectarian dualism contrasting insiders with outsiders, the contrast is rather temporal—the apostles were privileged to see in their time what the prophets had not been able to witness in theirs. Working backward from the Blessedness of the Twelve pronouncement to the Mysteries of the Kingdom of Heaven saying, the contrast is between the apostles, for whom the mysteries are disclosed, and the “others,” for whom the mysteries are concealed “in parables.” According to rabbinic sources, the Israelites on the shores of the Red Sea saw clearly, since God’s redeeming power makes the Kingdom of Heaven manifest, but in the days of the prophets God’s purposes were cloaked in parables. Since the arrival of the Kingdom of Heaven was the central component of Jesus’ message, it appears that in the Mysteries of the Kingdom of Heaven saying the contrast is again not between insiders and outsiders, but between the manifestations of the Kingdom of Heaven in the present that were taking place with and through Jesus’ followers, versus the hiddenness of the Kingdom of Heaven, even from the prophets, in prior generations. Taking a final step backward to Yeshua’s Thanksgiving Hymn, the contrast between the “wise and intelligent” and the “simple” may not be between two contemporaneous groups, rather the contrast may once again be temporal. In other words, “these things” were hidden from even the most deserving members of previous generations, but now they are revealed even to Jesus’ simple followers in the present time. Understood in this way, Yeshua’s Thanksgiving Hymn does not disparage the “wise and intelligent” any more than the Blessedness of the Twelve pronouncement disparages the “prophets and messengers.” To the contrary, in ancient Jewish sources there is a widespread belief that the generations of the biblical period were more meritorious than the present generation. Facilitating our interpretation of the contrast between the “simple” and the “wise and intelligent” in Yeshua’s Thanksgiving Hymn is the pairing of prophets and the wise in ancient Jewish sources. מֵחֲכָמִים וּנְבֹנִים (HR). In LXX the pairing of חָכָם (ḥāchām, “wise”) with נָבוֹן (nāvōn, “intelligent”), in either order, is translated in a variety of ways. Joseph is described in Hebrew as אִישׁ נָבוֹן וְחָכָם (’ish nāvōn veḥāchām, “an intelligent and wise man”) and in Greek as ἄνθρωπον φρόνιμον καὶ συνετόν (anthrōpon fronimon kai sūneton, “a wise and intelligent man”; Gen. 41:33; cf. 41:39). The heads of Israel’s tribes are referred to as אֲנָשִׁים חֲכָמִים וּנְבֹנִים וִידֻעִים (’anāshim ḥachāmim ūnevonim vidu‘im, “wise and intelligent and knowledgeable men”) in Hebrew and as ἄνδρας σοφοὺς καὶ ἐπιστήμονας καὶ συνετοὺς (andras sofous kai epistēmonas kai sūnetous, “wise and understanding and intelligent men”; Deut. 1:13) in Greek. Moses assured Israel that if they keep the commands of the Torah the Gentiles will conclude חָכָם וְנָבוֹן הַגּוֹי הַגָּדוֹל הַזֶּה (ḥāchām venāvōn hagōy hagādōl hazeh, “this great nation is wise and intelligent”), which LXX renders as σοφὸς καὶ ἐπιστήμων (sofos kai epistēmōn, “wise and understanding”; Deut. 4:6). In answer to his prayer, the LORD promised to grant Solomon “a wise and understanding heart” (לֵב חָכָם וְנָבוֹן; lēv ḥāchām venāvōn; 1 Kgs. 3:12), which the LXX translators rendered καρδίαν φρονίμην καὶ σοφήν (kardian fronimēn kai sofēn, “a prudent and wise heart”; NETS; 3 Kgdms. 3:12). The Qumran scroll of Thanksgiving Hymns (1QHa) as it appeared at the beginning of its unrolling. Image courtesy of the Shrine of the Book, Israel Museum. Luz noted an important distinction between the Qumran Thanksgiving Hymns and Yeshua’s Thanksgiving Hymn: whereas the author of the Qumran Thanksgiving Hymns thanked God for revelations that he received, Jesus thanked God for revelations that were given to others. In some DSS texts פתאים sometimes appears as a self-designation for members of the sect (cf. 1QpHab XII, 4). Jesus sometimes reapplied titles the Essenes used for themselves to his own disciples, as when he referred to his own followers as the “poor in spirit” (Matt. 5:3), an exact equivalent to עניי רוח (‘aniyē rūaḥ, “poor of spirit”) found in DSS (1QM XIV, 7; cf. ענוי רוח [‘anvē rūaḥ, “meek of spirit”] in 1QHa VI, 3). Here it appears that Jesus applied the Essene self-designation פְּתָאיִם to his twelve apostles. הֵן אַבָּא (HR). In LXX the affirmation ναί (nai, “yes”) is rare. Where there is a Hebrew equivalent, that word is אֲבָל (’avāl, “but”; Gen. 17:19; 42:21) or הִנֵּה (hinēh, “behold”; Isa. 48:7). We have reconstructed ναί with הֵן (hēn), a word that in BH usually means “behold,” but which sometimes approaches the meaning “yes,” and which in MH had definitely attained this meaning. In its concluding affirmation Yeshua’s Thanksgiving Hymn appears to temporarily slip out of Qumran-style Hebrew into a style closer to MH. In Matt. 11:26 and Luke 10:21 we find not a petition, but a declarative statement, which makes the rabbinic formula an inexact parallel to the conclusion of Yeshua’s Thanksgiving Hymn. The word order εὐδοκία ἐγένετο (“desire [it] was”) is the opposite of הָיָה רָצוֹן. It is of course possible that the Greek translator of the conjectured Hebrew Life of Yeshua changed the word order, but a reconstruction that has the same word order in Hebrew as we find in the Greek text is preferable. In LXX ἔμπροσθεν + personal pronoun is almost always the translation of לִפְנֵי + pronominal suffix, whereas מִלִּפְנֵי + pronominal suffix is never translated in LXX as ἔμπροσθεν + personal pronoun without the addition of a preposition meaning “from.” Since there is no preposition in Matt. 11:26 and Luke 10:21 equivalent to “from,” the evidence from LXX points to לְפָנֶיךָ (“before you”) for HR, rather than מִלְּפָנֶיךָ (“from before you”) as in the rabbinic formula. In LXX ὅτι οὕτως (“because thus”) is the translation of כִּי כֵּן in Judg. 14:10; 1 Kgdms. 5:7; 2 Kgdms. 3:9; 13:18; 3 Kgdms. 1:30; 2:7; 13:9; 2 Chr. 8:14; Ps. 64:10; Job 9:2. In LXX εὐδοκία (evdokia, “good will”) is relatively rare in books also found in MT, but when it does occur it almost always occurs as the translation of רָצוֹן (rātzōn, “desire”). The versions of Yeshua’s Thanksgiving Hymn in Matthew and Luke are nearly identical. Their only disagreement in the hymn itself is in L6 where Matthew has ἔκρυψας (“you hid”) but Luke reads ἀπέκρυψας (“you hid away”). Probably the author of Luke is responsible for this change. Even in their narrative introductions, where there is the least agreement, Matthew and Luke are still fairly similar. Both open with a time marker (L1) and introduce the hymn with εἶπεν (“he said”; L3). Luke describes Jesus’ elation by means of the Holy Spirit. Although many scholars assume that Luke added these details, rather than supposing that Matthew omitted them, we have found that Luke’s introduction reconstructs easily into Hebrew and that the mention of the Holy Spirit is culturally appropriate to a first-century Jewish context. 1. Would addressing God as “my father” have been considered offensive or blasphemous in first-century Jewish culture? 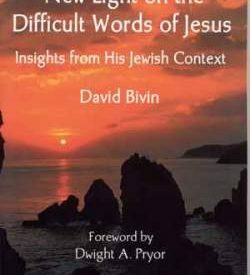 Unfortunately, the misconception that Jesus somehow offended the religious norms of ancient Judaism by addressing God as “my father” persists, despite the discovery of prayers from before the time of Jesus in which God is addressed as “my father.” “My father” may not have been the most common address in Second Temple Jewish prayer, but it was not unheard of and it certainly was not offensive or blasphemous, as the examples from DSS attest. 2. Who are the “wise and intelligent” and who are the “simple” in Yeshua’s Thanksgiving Hymn? Read in isolation, it would be impossible to identify the “wise and intelligent” in Yeshua’s Thanksgiving Hymn with certainty. Read in conjunction with the Mysteries of the Kingdom of Heaven saying and the Blessedness of the Twelve pronouncement, however, it is possible to identify the “wise and understanding” as the worthy representatives of prior generations who were not privileged to see what even Jesus’ simple followers were permitted to witness in the present time. Understood in this way, Yeshua’s Thanksgiving Hymn is not an expression of sectarian ideology pitting the insider against the outsider, it is rather a celebration that the long-awaited promises of God for Israel’s redemption are finally beginning to be fulfilled. It is ironic, therefore, that Jesus referred to the beneficiaries of the divine revelations as the “simple,” since this is a term the Essenes sometimes applied to themselves. Jesus appears to have taken over this Essene self-designation and reapplied it to his own followers in a non-sectarian fashion, just as he took over the thanksgiving hymn genre known from the Dead Sea Scrolls to express his own gratitude for what God was doing in their midst. The ironic usage of sectarian terminology to express his unique understanding of God’s redemptive purposes is characteristic of Jesus’ teachings. 3. Did Jesus ever address God as “Abba”? Some scholars have claimed that Jesus always addressed God as אַבָּא (’abā’, “father”) and that this proves how much more intimately Jesus related to God than did his contemporaries, and that, since “Abba” is an Aramaic word, Jesus must have spoken Aramaic. Let’s take these points one by one. Supposing that whenever Jesus addressed God as “father” the term he used was always “Abba” glosses over the fact that in the Greek texts of the Synoptic Gospels Jesus addresses God as “father” in a few different ways, including πάτερ (pater, “father”), πάτερ μου (pater mou, “my father”) and ὁ πατήρ (ho patēr, “the father”). Jesus also instructed his disciples to address God as πάτερ ἡμῶν (pater hēmōn, “our father”). Only one of these addresses, ὁ πατήρ (“the father”), is equated with “Abba” in the New Testament (Mark 14:36; Rom. 8:15; Gal. 4:6). It is not the case, as some scholars used to assert, that the form אָבִי (’āvi, “my father”) had become obsolete by the time of Jesus, so that he had no choice but to address God as “Abba.” Why, then, do some scholars claim that all these forms of address reflect an original “Abba”? Does his use of “Abba” prove that Jesus had a more intimate and personal relationship with God than his contemporaries? The answer must depend on which contemporaries we have in mind. There were some first-century Jews who had a more formal and less familiar relationship with God than Jesus did. Such persons might not have addressed God as “Abba.” On the other hand, some first-century Jews did experience a familial relationship with God. Among these were the pietists known as the Hasidim. We know that some people addressed God as אָבִי (“my father”) in their prayers, and it is hard to see how addressing God as אַבָּא (“Abba”) would have been perceived differently, since “Abba” was a respectful form of address in Mishnaic Hebrew. Addressing God as “Abba,” therefore, does not distinguish Jesus from Judaism, it rather helps us to distinguish Jesus’ place within Judaism, by highlighting his similarity to individuals like Honi the Circle-drawer, Hanina ben Dosa and other first-century Jewish pietists. Finally, does Jesus’ use of “Abba” prove that he spoke Aramaic? Not at all. “Abba” was used in Hebrew and Aramaic, therefore Jesus’ use of “Abba” cannot help us determine which of the two Semitic languages Jesus may have spoken. Probably Jesus knew and used both languages, and maybe Greek, as well. The caves at Qumran. Photo courtesy of Joshua N. Tilton. 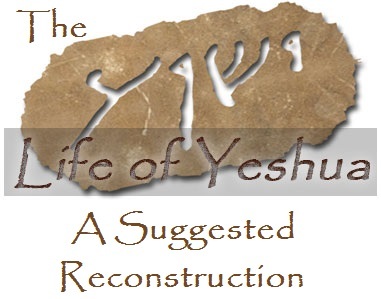 Click here to return to “The Life of Yeshua: A Suggested Reconstruction” main page. The inclusion of Woes on Three Villages in the Sending discourse creates a dramatic shift from addressing the apostles (insiders) to addressing unrepentant villages (outsiders). In the Sending discourse repentance is not part of the apostles’ message, but in Woes on Three Villages Jesus upbraids the people for not repenting. Capernaum and Bethsaida (two of the three towns mentioned in Woes on Three Villages) are places that Jesus had visited himself, but the Sending discourse is about preparing the apostles to enter places Jesus had not visited. Jesus had just given instructions to the apostles regarding how they were to deal with towns that did not receive them, while Woes on Three Villages is about towns that did not receive him. Jesus said that a town that failed to receive the apostles would be subject to judgment, while in Woes on Three Villages Jesus pronounces judgments against specific towns in the Galilee. Sodom, mentioned in the instructions to the apostles, was a Gentile city known in Scripture for its wickedness. Tyre and Sidon, mentioned in Woes on Three Villages, were also Gentile cities known in Scripture for their wickedness.